I’m a self confessed Dutchophile. There’s something about the colour ‘Oranje’, the unique sound of the language (which I’m ‘trying’ to learn), the windmills, clogs, tulips, hagelslag, stroopwafels, Edam cheese and (until recently challenged) liberal attitudes. I feel there is much to admire about the resourcefulness of the people of the Netherlands, once a economic powerhouse in the 1600s, where making the most of limited land has been vital. This was particularly embodied by the philosophy of ‘Totaal’, where the ability of space to have multiple uses influenced (particularly architectural) philosophies within the general liberal Dutch culture of the 20th Century. Famously, this was reflected in the revelation that was the ‘Totaalvoetbal’ approach of the Dutch football team of 1970s, particularly in the iconic late Johan Cruijff – setting the ground work for modern football. Importantly, it is also an part of the world which is specialised and passionate about maps and GIS, and naturally it has to be given another Dutch characteristic – the general low-lying nature of the land and the threat of flooding. This is reflected the geospatial analysis I have created in the map below, using digital terrain data and zonal statistics, using a Dutch gemeenten (municipalities) boundary GIS layer, to extract a average height of land above sea level (m). 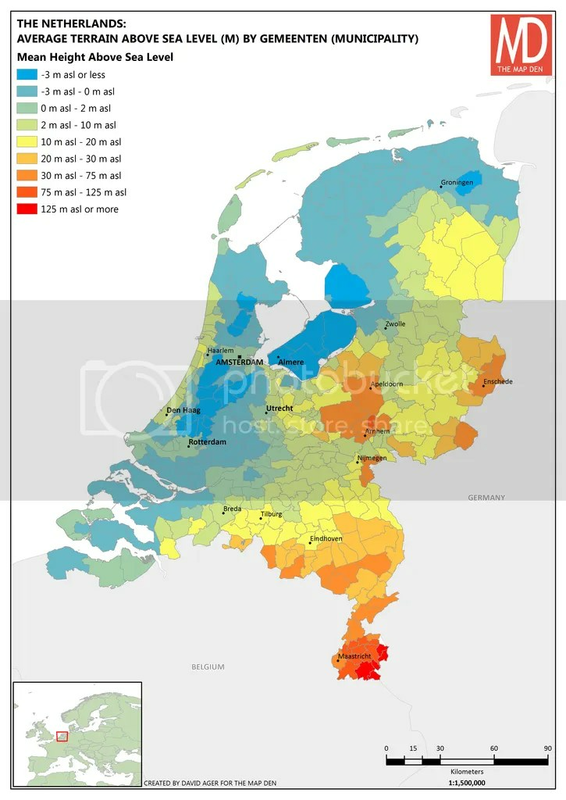 Many parts of the world have regions which are low lying and below sea level, but averaged over a given area, are likely to average a height above sea level, but not so in many parts of the Netherlands. This map reflects the ingenuity of the Dutch with land reclamation and flood defence engineering, particularly pertinent in a age of global warming and sea level rise. There is an expression, “God schiep de Aarde, maar de Nederlanders schiepen Nederland (God created the Earth, but the Dutch created Netherlands)”. This reclamation of land has been done through the use of windmills to dry the land historically, and moreover by series of diks, pumping stations and sluices, which enclose the area as a water body that is separated from sea and eventually drained to form land, also known as a ‘polder’. These polders (of which the Netherlands has over 3,000), have to remain protected with flood defenses, and it is a legal requirement of flood defenses in the Netherlands to be resilient to flood magnitudes 1 in 10,000 years. Indeed, living on such low-lying land and needing defend and reclaim land makes their expertise and political co-operation in this area a necessity. The consequences of not being sufficiently prepared are all too close to home, particularly remembering over 1,800 Dutch people were killed by the 1953 North Sea flood (‘Watersnoordramp’). The mindset of ‘mastering’ the water and land, has led to some great engineering feats of their time- including Beemster (1609-1612); the Haarlemmeerpolder (1852), where Schiphol Airport is situated despite being an average of 3 metres below sea level; and finally the Zuiderzee Works (1928 – 1975). The latter of these has been described as one of the Eight Wonders of the Modern World, where a series of three polders were formed in the once Zuiderzee inlet sea of northern Netherlands. This included the construction of the Afsluitdijk (1932) which inclosed a freshwater body, and one of the polders, Flevoland (see Almere), is the largest artificial island in the world. Remarkably, 1650 km sq of land for agriculture and urbanisation. With this drainage and reclamation, the land subsides to a level below where it once was, hence the low lying nature of much of the country (see original map). Indeed, according to a friend of mine who used to live in the Netherlands, their local football pitch was behind a walled water body, some 2 metres above them. But in, ironically the world’s ironically tallest country, with long history of a proactive and protective approach to geography, this is just normaal dagelijkse leven (normal, daily life). PS: I hope this to be a start of a series of maps, looking at interesting geospatial analysis about countries all over the world, so let me know of any ideas and stay tuned! Next Post: Football and Economics – A good match?